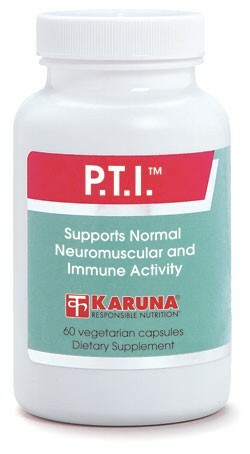 to support normal neuromuscular and immune activity for short-term use during the early stages of the healing process. Neuromuscular stability is supported with valerian, passion flower, and black cohosh concentrates, as well as calcium, magnesium and niacinamide. 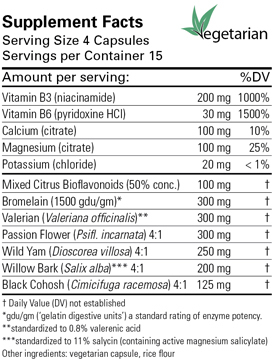 Immune activity is balanced with bromelain and concentrated willow bark extract. Local blood vessel permeability and fluid balance are regulated with the help of citrus bioflavonoids. For best results, take on an empty stomach (30 minutes prior to or 2 hours after a meal). Refer to About...Bromelain and About...Valerian. Suggested use for adults: Four capsules daily, or as directed.